Much of management involves talking about things, and Knowledge Management is no exception. Many management disciplines are based on conversation, especially those disciplines which seek to raise awareness and change behaviours of an issue. Safety Management, for example, is driven by conversations about safety in order to drive awareness of safety issues, identify mitigating actions, and promote safe behaviours. If nobody discusses safety, then safety becomes a low priority issue, or an invisible issue. The conversations raise it to a visible, priority issue. The same is true of Risk Management. This is driven by conversations about risk, in order to drive awareness of risks to projects, to identify mitigating actions and to drive risk-aware behaviours. Conversations within a project team, at the start of a project, to discuss "what do we know about delivering projects of this type, and what knowledge gaps do we have"? This is a conversation that happens as part of a KM Planning workshop. Conversations within a team as work progresses, to discuss "what are we learning about how we work, and what do we need to change or sustain as a result"? This is a conversation that happens as part of an After Action Review. Conversations within a project team at the end of a project or project stage, to discuss "what new knowledge have we gained, that we should share with others, or use again"? This is a conversation that happens as part of a Retrospect. Conversations between projects, to discuss "what do you know that can help us"? This is a conversation that happens as part of a Peer Assist or Knowledge Handover. Conversations between members of a community of practice, to discuss "what do we all know together, and what does this mean for the way we do our jobs"? This is a conversation that happens as part of a Knowledge Exchange, or online within a discussion forum. These conversations about knowledge drive awareness of knowledge issues, identify actions to apply that knowledge, and promote knowledge behaviours. 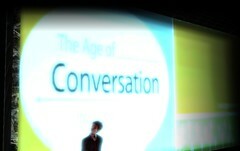 The conversations raise knowledge to become a visible, priority issue. Steven Denning, at one- time the head of Knowledge Management at the World Bank, said at the Ontario KM summit in 2006 that “the learning capacity of an organization is directly related to its ability to hold conversations”. I think he was right, don't you?